Accuracy is everything when it comes to piecing. So many angles to align and pieces to match. 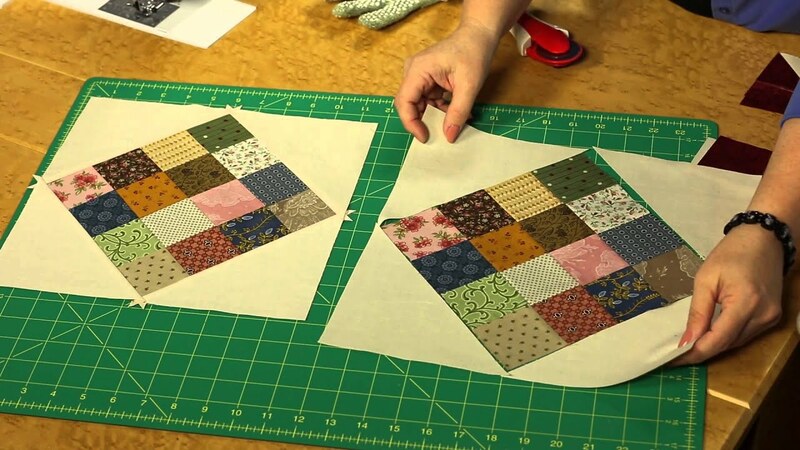 No one wants to cut up their favorite fabrics and labor over an A+ quilt block only to discover that it’s come out too small, or the pieces don’t fit together quite right, or whatever misfortune tends to befall you at this phase. Here are a few things you can do to improve accuracy and prevent the sting of a bad piece. Trimming can be time consuming and overlooked when everything “looks good” but verifying that the pieces are the right size before continuing in the project will make a big difference! Most quilt patterns call for a ¼” seam allowance, and they mean it! If your seam allowance is off by even 1⁄16″, it can make a big impact on the final quilt. Even a tiny degree of error can really add up over the course of a block, so get in the habit of stitching a scant seam. We get it: It’s way more difficult to achieve a true ¼” seam than you’d think. And you’re not always set up for success either since it’s common for the ¼” markings on your sewing machine or even your ¼” presser foot to be noticeably off. The only way to be sure you have an accurate seam is to stitch a ¼” seam following the presser foot and measure it with a clear ruler. Make sure your seam is right on the ¼” mark and not a touch over. In the above image, the seam on the right was sewn following the edge of a ¼” presser foot, which resulted in a seam that was just on the outside of the ¼” marking. No good! What’s better than a seam that’s exactly ¼”? A seam that’s a just under ¼”, AKA a scant ¼” seam! Check out the seam on the left in the image above. To sew a scant team, make sure you can’t see the drawn line outside of the presser foot; instead, keep it just under the very edge of the foot. This small change will keep your seams just a couple of thread widths under ¼”, which will account for both the seam and the actual fold in the fabric when your press your seams under. There’s a right and a wrong way to press fabric. First, make sure your iron is on the highest cotton setting, and don’t be afraid to use some steam. If you’re working with fabrics that are cut on the bias, handle them with care so they don’t stretch while being ironed. This is important: Make sure you’re “pressing” and not “ironing.” That means placing your iron straight down on the fabric, not moving it back and forth like you’re trying to get wrinkles out of a dress. 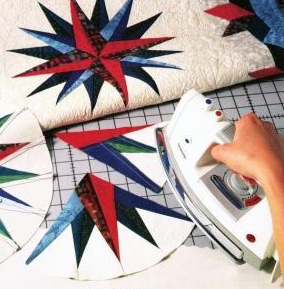 Moving a hot steaming iron back and forth over your quilt pieces is almost guaranteed to stretch and distort them. 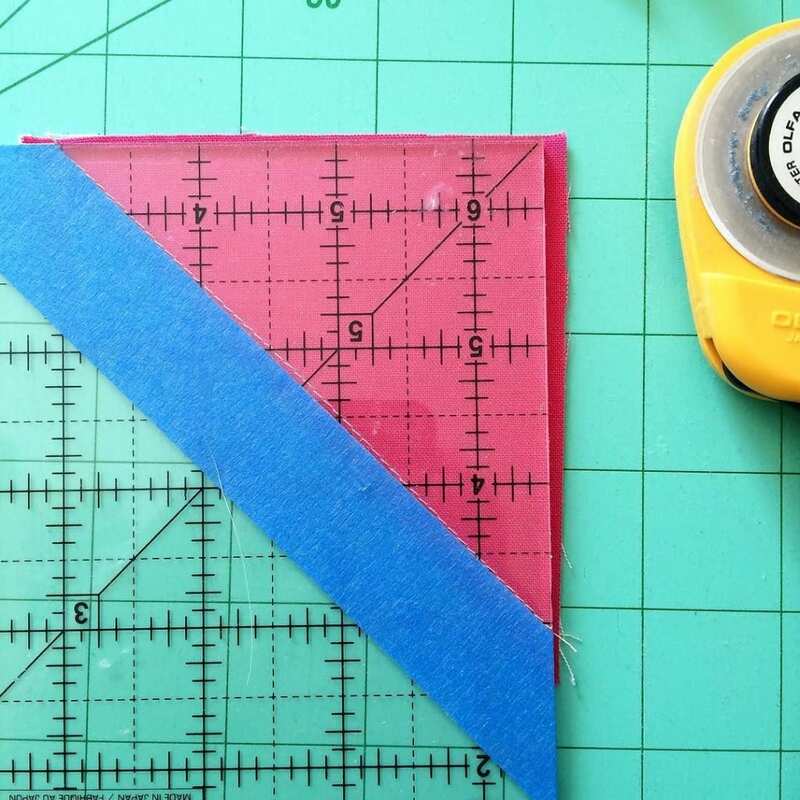 Starching fabric before cutting and while pressing is one of the best ways to stay accurate. You’ll notice that seams lay flatter and fabrics stay crisp throughout the piecing process. Since starch makes fabrics stiff, it prevents distortion when you’re handling and pinning pieces. And it rinses right out in the wash when you’re done. There are plenty of starches on the market, but one of our favorites is Mary Ellen’s Best Press Spray Starch. Some blocks — like half-square triangles and quarter-square triangles — end up with little tails or dog ears of fabric that extend into the seam allowance. These just add bulk, so make sure to trim them off. You might think you’re being economical using tools that are past their prime, but you really aren’t doing yourself any favors. Dull blades and needles make accuracy borderline impossible, so plan to get new tools for each quilt project. Ahh, one of our favorite mantras. Measuring correctly is critical, so read requirements carefully and make sure you have the right ruler for the job. Clear, non-slip rulers are best. You can also add adhesive gripper tape (such as Handi Grip Strips or Grip Discs ) to help with slippage. When you’re cutting several units from the same piece of fabric, stop occasionally to make sure the fabric is still square. Sure, it takes a bit of extra time to stop and square up your fabric, but it’ll result in much more even cuts for your blocks. There’s no way around it: Quilters need math. So if you haven’t done much division since high school, now’s the time to get reacquainted. You’ll need to understand how pieces add up to equal a total measurement on a block or quilt. And calculate how much fabric you’ll need to purchase at the quilt shop. And determine how many strips to cut for your binding. You’ll just need to know the basics, so get ready for a little number-crunching on the old calculator. Truth be told, if you cut and sew your blocks accurately, you may not need to square up your final block. But some patterns tell you to make blocks a little large and then trim them down to the exact size needed. Make sure blocks and block segments are the correct size before putting them together in your quilt. An acrylic ruler is your best bet for the most accurate squaring up.